Recently, I asked my Vial Design Insiders (if you’re not one yet, make sure you get amongst them here) what was something they were struggling with regards to their calligraphy journey and what was something they’d like to see more in my blog. One of the things that kept coming up was to learn how to letter phrase or sentiments so they could make cards! 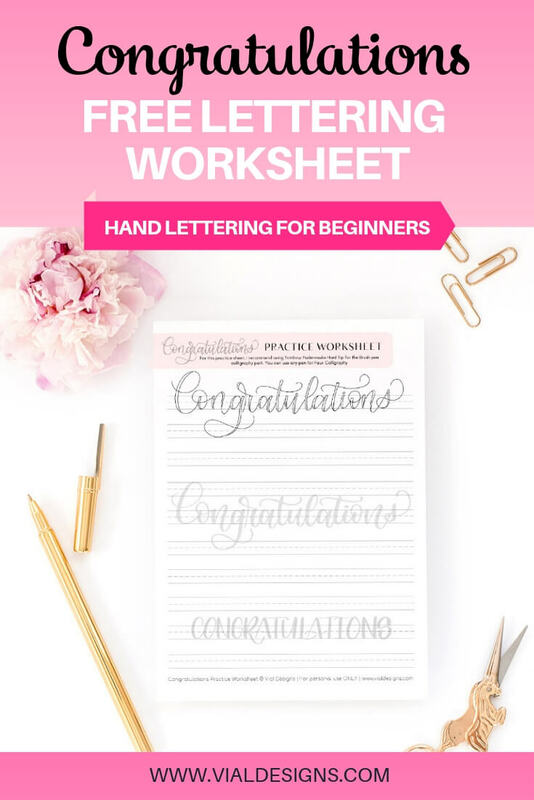 Since practicing new words is a great way to improve your lettering and calligraphy, I want to help you do just that! 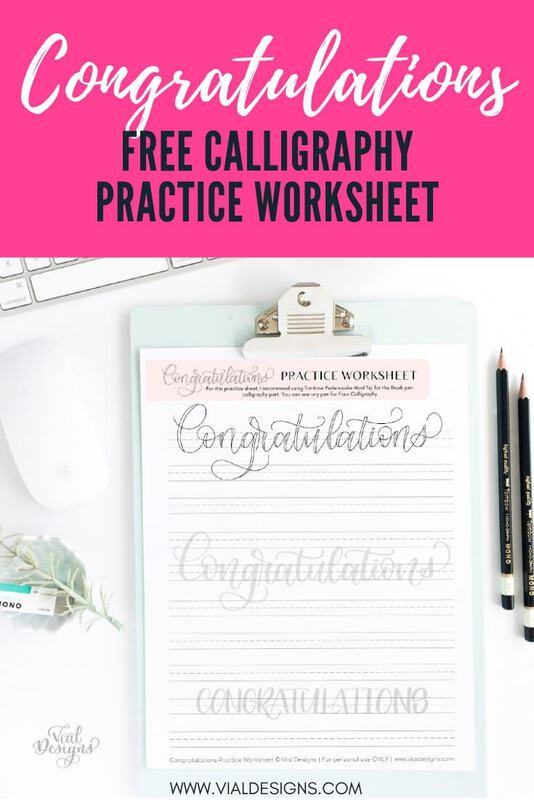 That’s why I created this FREE Congratulations worksheet you can use to get your practice going. If you’ve been struggling or have been wanting to learn something new about calligraphy, you can let me know by filling out this short survey. 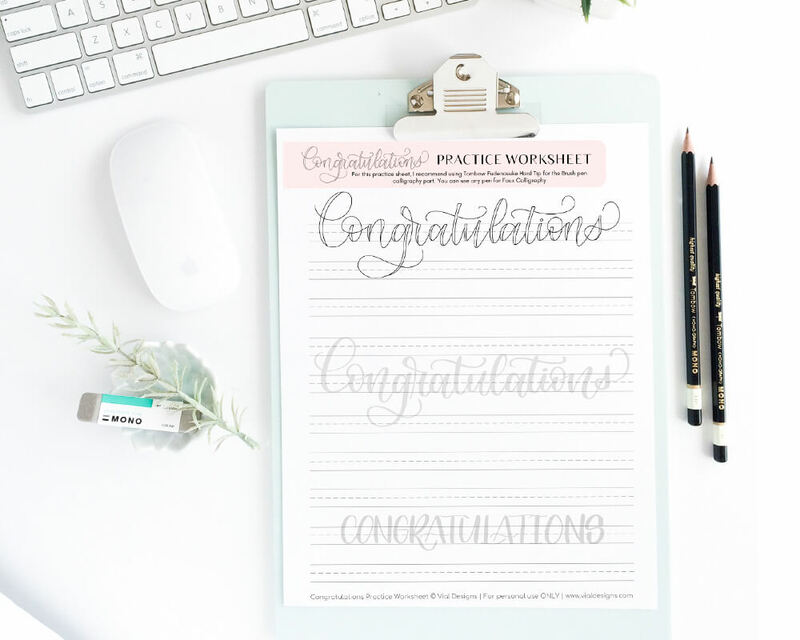 I chose Congratulations as the word for these Free Calligraphy worksheet because Graduation Season is coming up and I know you’ll be glad you know how to letter this word. 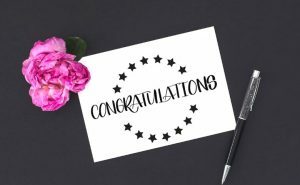 Also, knowing how to letter congratulations is great because you can create a handmade card for any other occasion when a “Congrats” is in order. Today’s FREE practice worksheet will be in resource library as well, and you can get access to it by filling out the form at the end of this blog post. Brush Pen (Small Tip): I designed these worksheets with the Tombow Fudenosuke Hard Tipin mind, which are the pens I recommend them for beginners. The Tombow Fudenosuke also come in a soft tip and different colors, so you have different options to choose from. Fill out the form at the bottom of this post or go to my free resource library if you already have the password to get in. Once you’re there, select the practice sheet you’d like to download. 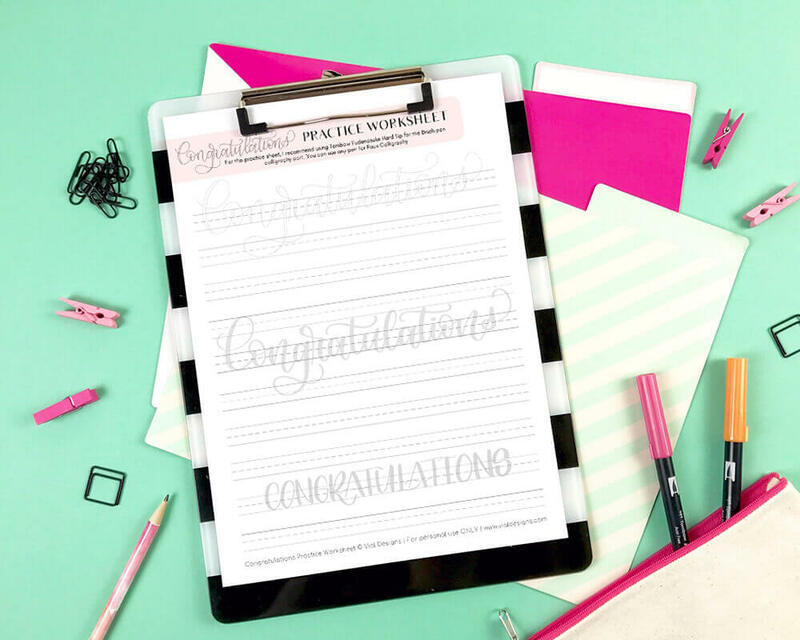 For this tutorial select the: Congratulations FREE Practice Worksheet. 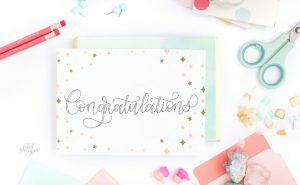 You can use any of the three different lettering styles I show you on the practice sheet to create your Congratulations Cards! WANT MORE FREE PRACTICE SHEETS? 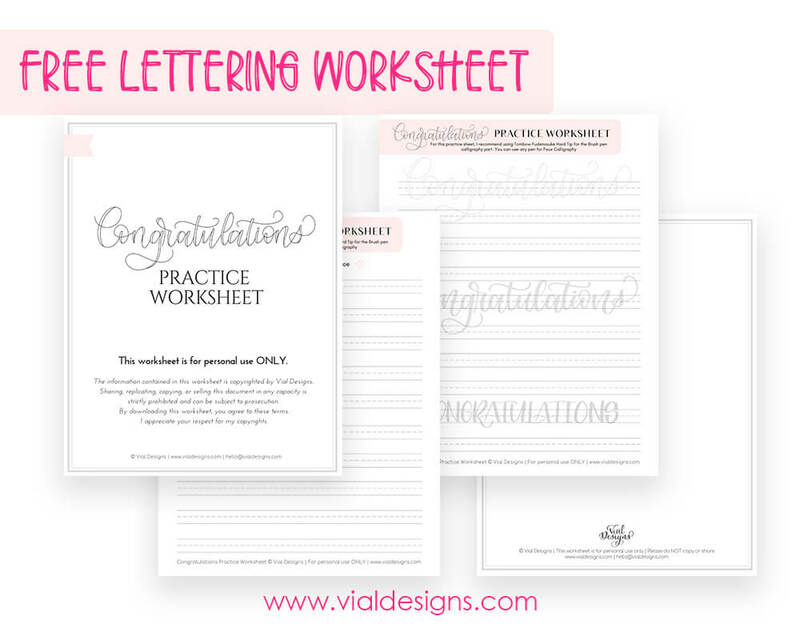 GET MY FREE LETTERING WORKSHEET! Subscribe (free!) 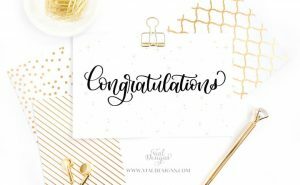 to get instant access to my resource library with this Congratulations Worksheet and all of my other free files, printables, and more! Subscribing gets you into my newsletter with updates and tips. 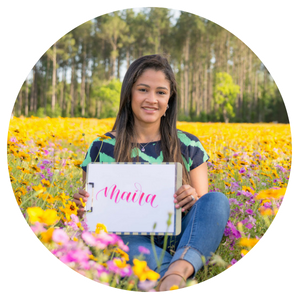 I will send you a weekly newsletter with details about my new free files and blog posts.